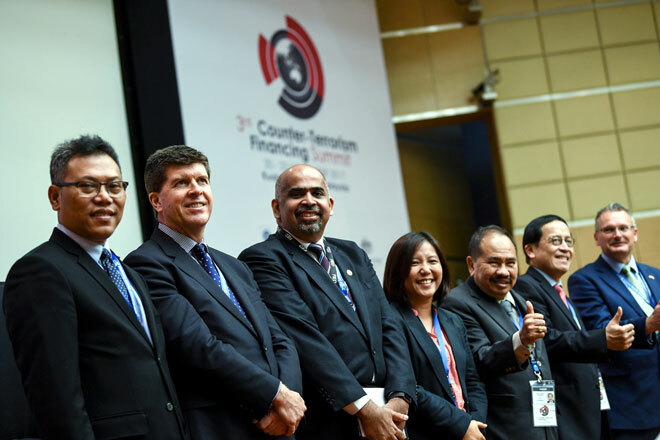 KUALA LUMPUR: The working groups of the 3rd Counter-Terrorism Financing (CTF) Summit are committed to expanding membership to all ASEAN member countries and New Zealand as well as broaden the scope of the summit to include other high-risk financial crimes. Currently, the working groups – namely the Financial Intelligence Consultative Group, International Community of Experts Forum, and Community Outreach Consultative Group – comprise Malaysia, Australia, Indonesia, Thailand, the Philippines and Singapore. The commitment was stated in the Kuala Lumpur Communique released in conjunction with the four-day summit which ended today. According to the communique, among others, the working groups will collaborate in support of the Australian Government’s initiative to disrupt terrorist groups, sources of funding, movement and use of funds and their overall financial networks in South East Asia (SEA) through the establishment of a SEA Counter Terrorism Financing Working Group (SEA CTFWG) that will extend the partnership with regional FIUs (Financial Intelligence Units) and other competent authorities through the CTF Summit framework. It said the working groups also agreed to strengthen partnerships and collaboration with industry and academia to enhance collective responses to regional priorities through the initiatives of the CTF Summit agenda and working groups. It also agreed to build on the success of recent analyst exchange programmes and undertake a multilateral financial intelligence exercise to jointly analyse suspicious financial transactions reported within the region that relate to suspicious activities of nationals operating outside their ordinary country of residence. The working groups also agreed to use the findings of the multi-lateral financial intelligence programmes to identify the requirements of a regional information and communications technology (ICT ) solution to streamline regional exchange, analysis and collaboration between competent anti-money laundering or counter-terrorism. According to the communique, the working groups also will support the findings from the regional risk assessment of Non-Profit Organisations (NPOs) and their recommendations, particularly to strengthen terrorism financing-targeted outreach and monitoring of identified NPO sub-sets at greatest risk of terrorism financing and to develop a set of regional red-flag indicators of high-risk NPO activity. The four-day summit, which started on Monday, gathered more than 350 specialists and professionals from international organisations to share their insight on the latest terrorism financing issues and developments. The summit was attended by 445 representatives from 32 countries, consisting of officials and international experts from FIUs, senior representatives from the policy, regulatory, law enforcement and national security agencies, FinTech/Regtech industry, financial industry, multi-lateral bodies, think tanks and academia from across the region and the globe. This year’s CTF Summit, themed ‘Powering Regional Solutions through Strengthened Alliances and Innovations’, further developed regional solutions to address terrorism financing issues and risks through the sharing of financial intelligence and the adoption of deliverables from the working groups.